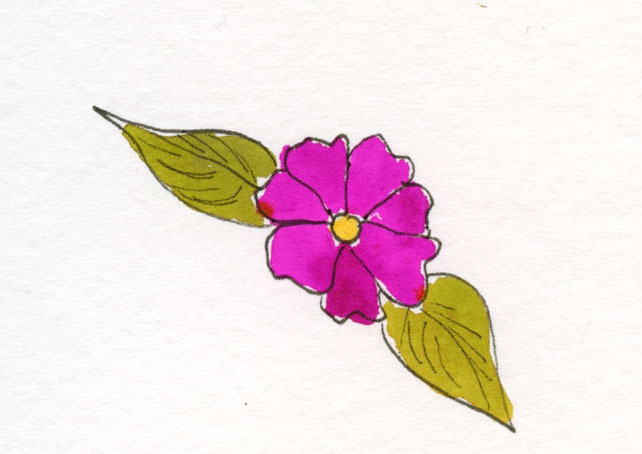 I haven’t used watercolors much since I became fully entrenched in colored pencils. My recent minimalism challenge, though, had gotten me thinking more about the general issue of portability and compactness, regardless of preferred media. My strategy during this challenge was to minimize my palette and make the most of every tool. 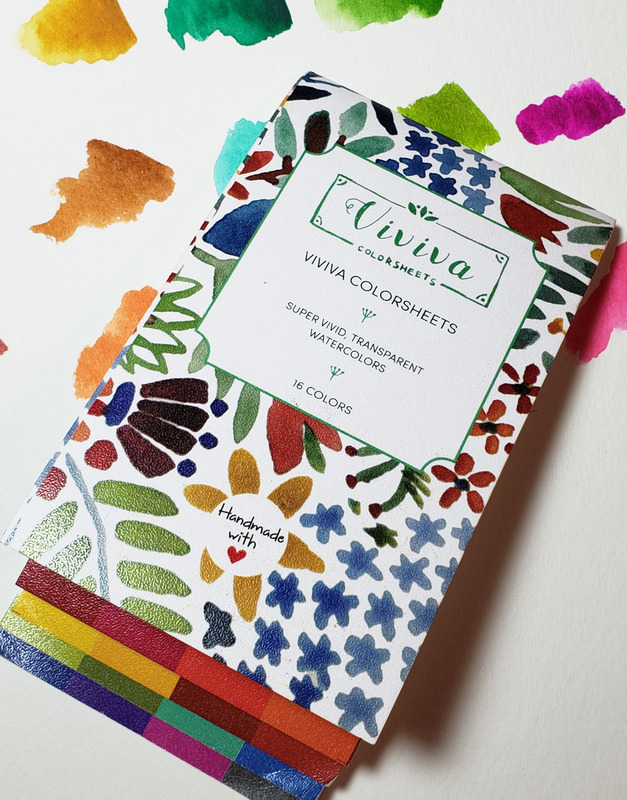 However, if I were anticipating a sketching situation in which I needed lots of hues but still wanted a tiny kit, Viviva Colorsheets might be ideal. 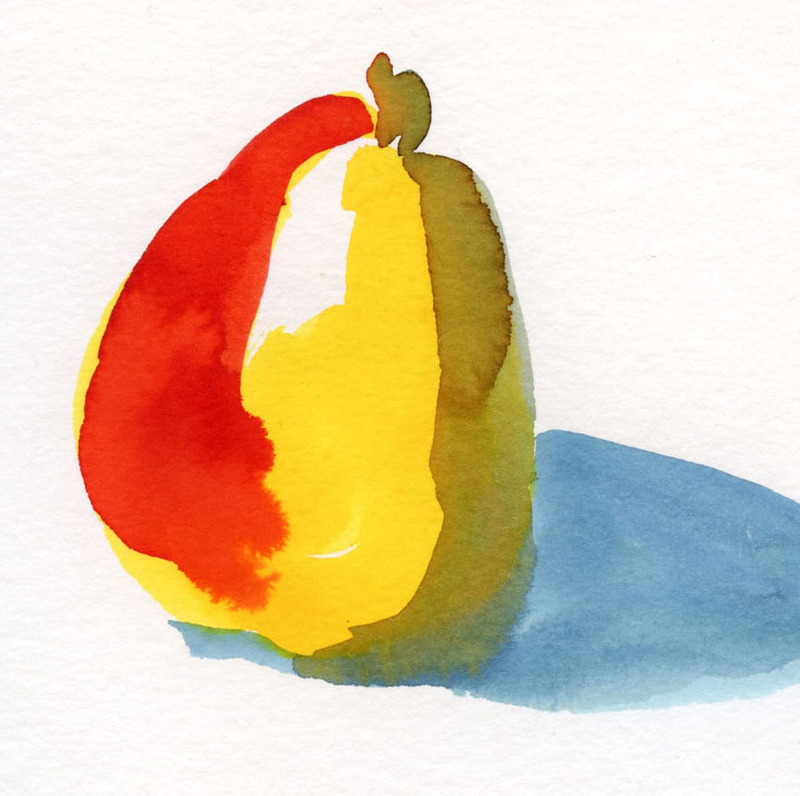 Concentrated watercolor paint stored on paper has intrigued me for a long time: Thin and lightweight, it seems like the ultimate portable paint kit! Several years ago when I first began urban sketching, I bought a booklet of Nicholson’s Peerless Water Colors with that thought in mind. 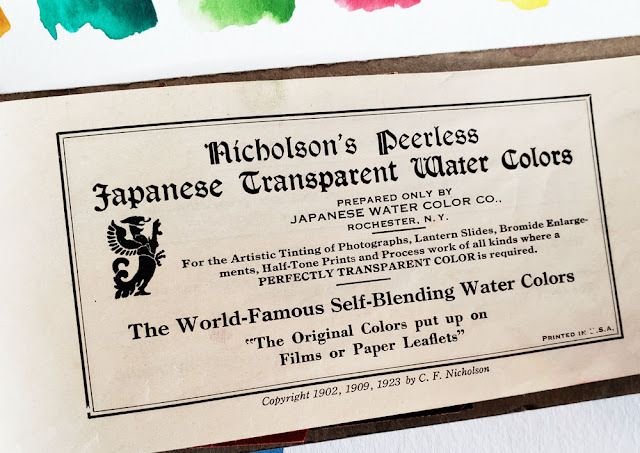 Around the same time, I serendipitously found a vintage booklet of Nicholson’s Peerless Japanese Transparent Water Colors in an antique store. I don’t know how old the booklet is, but the last copyright date on it is 1923! The antique sheets are so tattered that I’ve only used them to swatch the colors, but even after all these years, they are still bright and saturated. Tattered, but the pigments are still bright. So although the concept of watercolor paints stored in booklet form is not new or innovative, Viviva Colorsheets made significant improvements on Nicholson’s Peerless when the company developed its product with Indiegogo funding a couple of years ago. The first great idea with Viviva Colorsheets is the staggered page ends with colored index tabs, which make it much easier to find the color you want rather than constantly flipping through all the pages. Index tabs to make finding colors fast and easy. 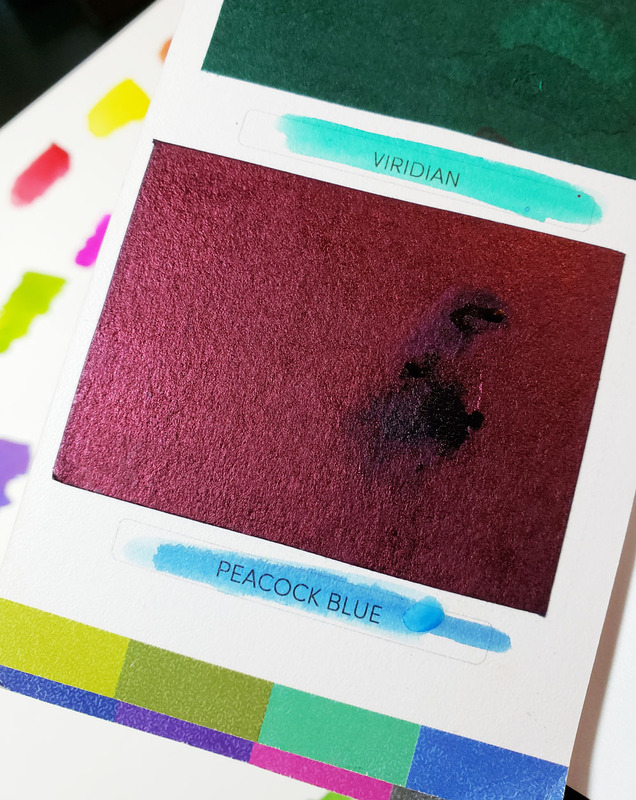 Each page has two pigment tiles. 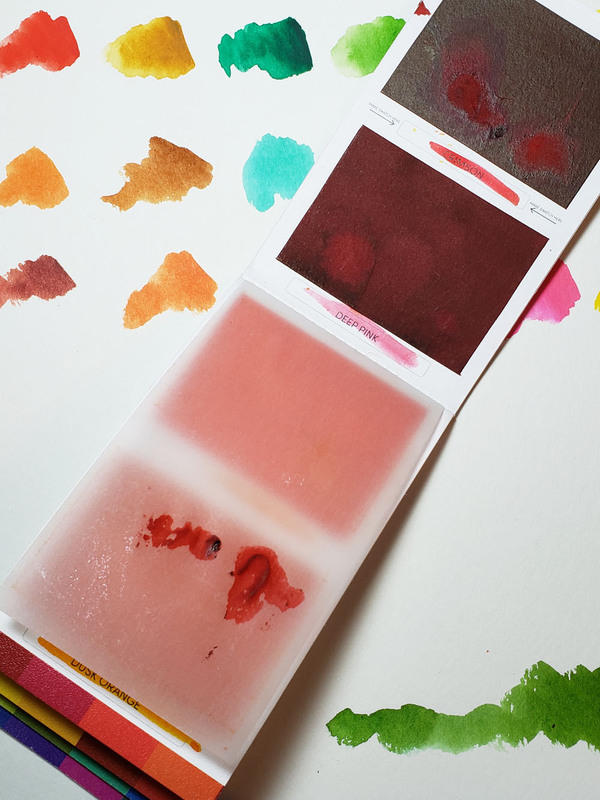 A space is given under each pigment area to make a small swatch. 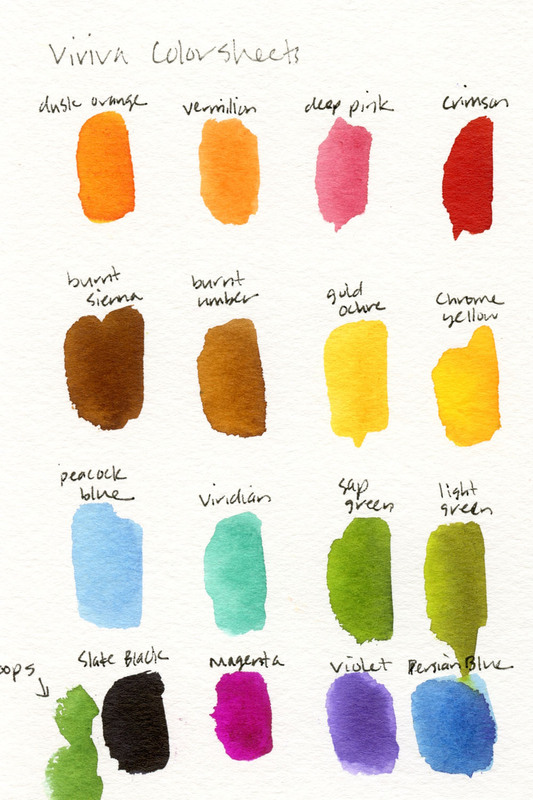 A place to make a swatch under each pigment tile. Many pigment tiles, especially the blues and violets, look very different from the hues that result from them, so it’s imperative to make swatches before using the paints, or you’ll be in for big surprises. Some hues look very different when activated with water. 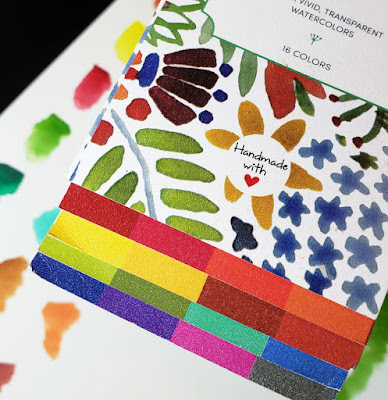 As “Viviva” implies, all the colors are vivid and saturated (swatches made on Canson XL 140-pound watercolor paper). Since anyone (like me) using Viviva Colorsheets instead of traditional watercolor paints would probably give priority to convenience and portability, I used a waterbrush instead of a true paint brush on these swatches and the sketches in this review. 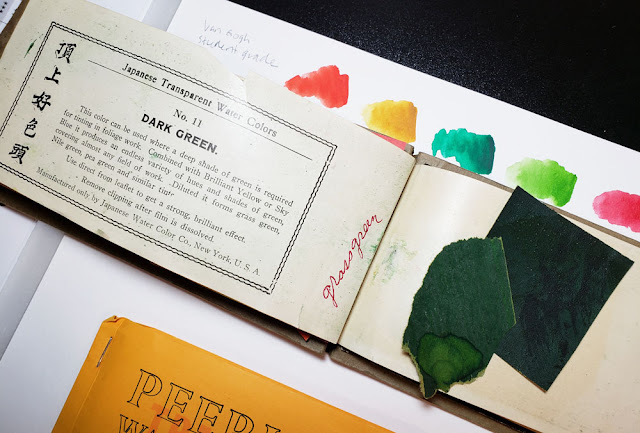 A second good idea is the sheet of nonstick glassine bound between every two pages of color to keep the pigments from mixing and sticking to each other. 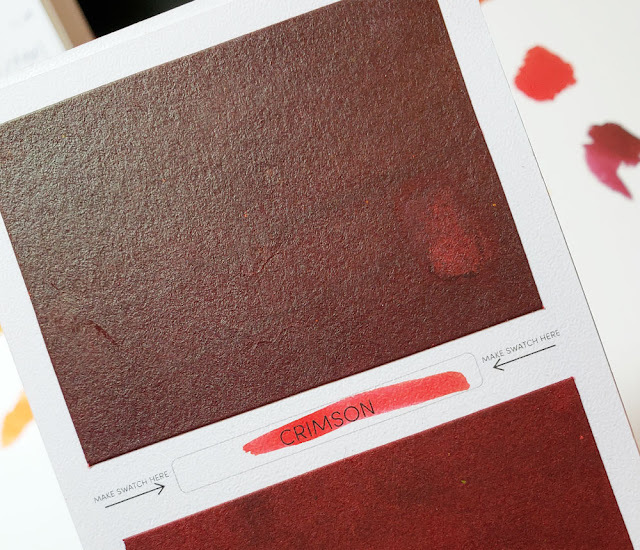 A sheet of non-stick paper keeps the pigments from sticking and mixing together. The last innovation is a great idea in theory – but in practice, not so much. It’s the mixing palette that’s inserted in the back of the Viviva booklet. 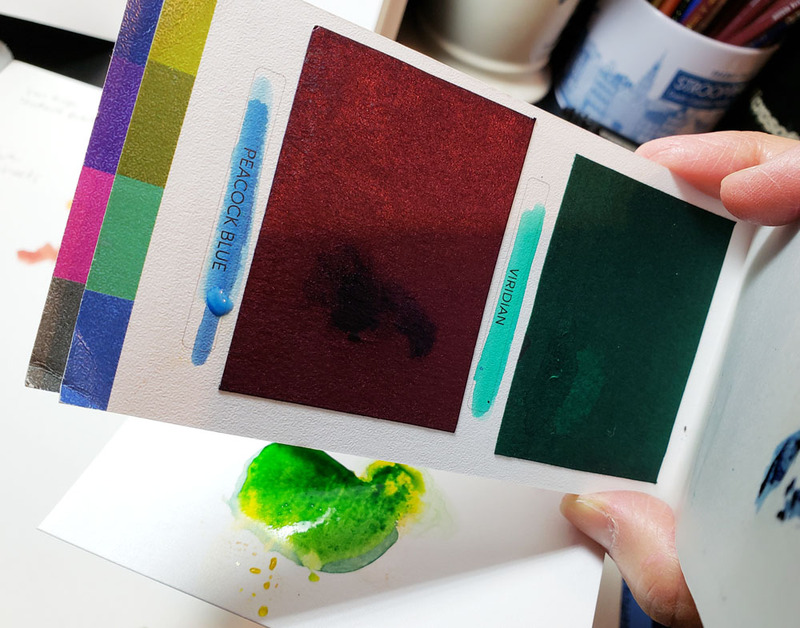 As suggested, I adhered the mixing palette, which is made of a heavy paper with a non-absorbent surface, to the booklet’s inside back cover. Awkward to hold and use with the palette attached. In fact, the “coloring book” sketch made me realize that I was looking at Viviva Colorsheets in the wrong way. 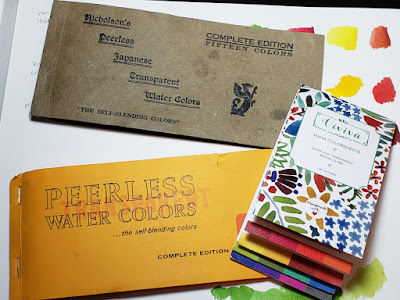 I don’t think they’re best used as traditional watercolors (or at least I found that they amplify the challenges of watercolor paints); it’s much better to think of them as markers or colored pencils. 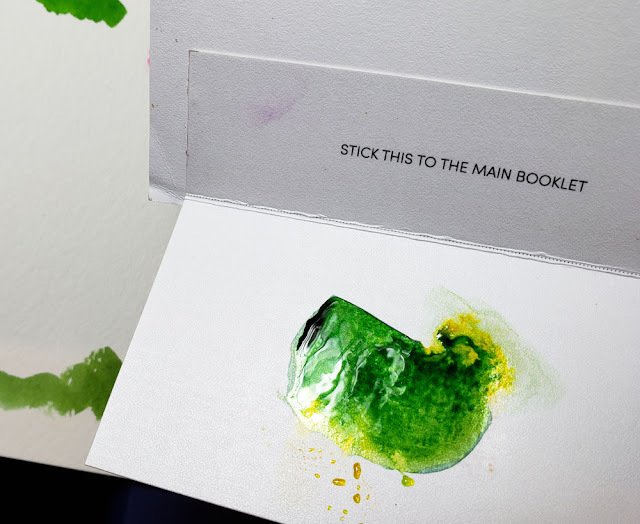 The tiny booklet is far slimmer and lighter than 16 markers or even 16 colored pencils. Forget about mixing and just have fun using these brilliant hues straight from the booklet. 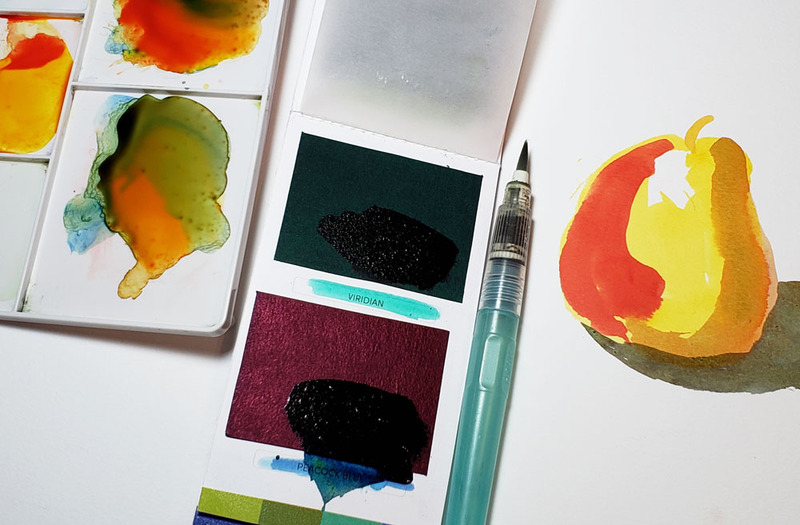 Packed with a waterproof pen and a waterbrush, that’s a pretty darn compact and convenient sketch kit that’s filled with color. A very portable sketch kit! Looks like a very compact painting kit. 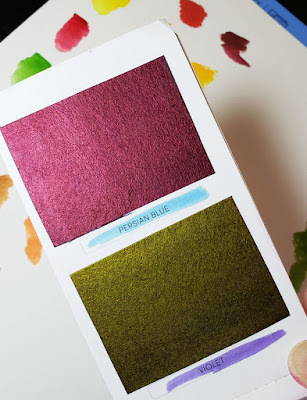 I like that they gave you room to do a test swatch, especially since the colors are so different from some of the swatches. The glassine between the sheets is also a good idea. It's a fun little kit! I would definitely use it if I were trying to keep my kit REALLY tiny!